The Mission of Saints Francis and Clare holds traditional Latin mass every Sunday at 402 NE 29 St. in Miami. Roman Catholic Mass was at one time universally celebrated in Latin, the ancient Roman language. After the second Vatican Council in the 1960s, Mass was allowed to be celebrated in the language of the people, meaning Mass in Peru was celebrated in Spanish and Mass in the United States was celebrated in English -- you get the picture. Latin is now sometimes referred to as “the dead language,” but it is not dead in Miami. Hear the audio version of this story. The Mission of Saints Francis and Clare is a Roman Catholic chapel in Miami that celebrates traditional Latin Mass every Sunday. It’s one of three local churches that offer this regular service. The mission has about 20 pews facing its single stained-glass window just above the altar. Father Joe Fishwick has been leading the traditional Latin Mass at the chapel for almost 20 years. He says he’s noticed a change in attendance recently. "The fascinating thing is the number of young people who discover the old liturgy and who fall in love with it," he says. "There's indeed a thirst for a return to one's roots." Father Fishwick says he has seen more and more young people at Sunday’s Latin Mass since the death of Pope John Paul II nine years ago. "I think maybe the younger generation, which has had no experience of that, has been completely starved of it," says 30-year-old Miamian Josue Hernandez. "They see it and they run to it because they have been so deprived." Hernandez attends Sunday Latin Mass at Saints Francis and Clare. 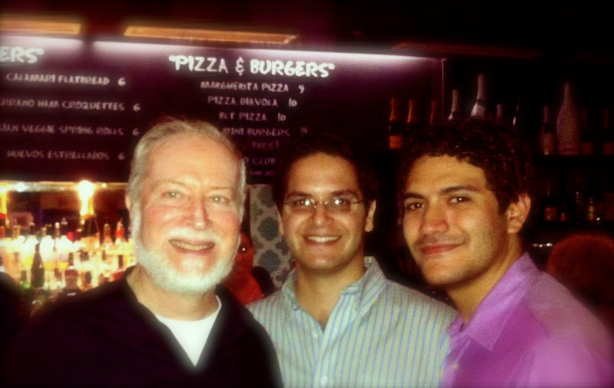 Father Joe Fishwick, left, joined Aramis Perez, middle, and the Juventutem Miami members for a nightcap after mass. "When you go to the older Mass, you have the Latin, you have the incense, you have the priest facing the crucifix and the focus is completely off you," he says. "All the attention is turned towards the sacrifice." Vida Tavakoli accompanies Hernandez, her fiance, to the traditional Latin Mass. She’s a 27-year-old public school teacher in Miami. The two plan to marry at a traditional Latin Mass this December. Hernandez and Tavakoli are a part of Juventutem Miami, or Youth Miami -- an international federation of young people between the ages of 16 and 36 who seek to grow closer to God through traditions of the Catholic Church, specifically the Roman Rite. Juventutem started eight years ago in Switzerland. The Miami chapter has only been around for one year. Aramis Perez, 30 years old, is the unofficial leader of Juventutem Miami. "We realized that we had a group of young people committed to the church, committed to each other and interested in bringing what we're discovering at the traditional mass to other young people," says Perez. 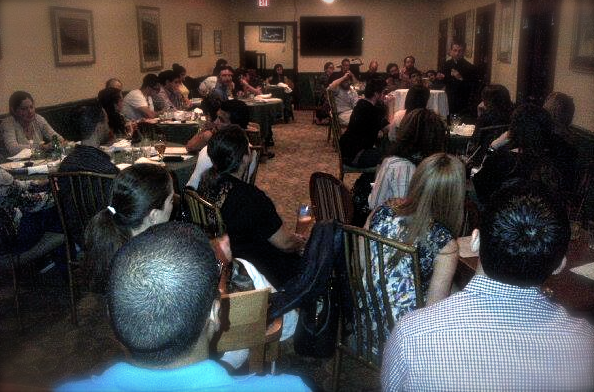 There are about 30 young members in Juventutem Miami. The group has led the traditional Latin mass almost 20 times at other Catholic parishes in Miami that no longer have that service. Juventutem Miami members at a "Dogma on Draft" event. Juventutem also hosts one or two social events each month. So far, they’ve met for food and drinks in Coral Gables, Miami Beach and Midtown. Perez says the growth in young participants is because people are just now learning that the traditional Mass exists. "When people realize that this treasure is out there for them, they become interested they want to enjoy it, they want to learn more about it, so we worked accordingly to make it more available," he says. At a traditional service, the priest is not the only one speaking in Latin. Congregants respond and pray in Latin as well, including the younger members. "You come into it and you're kind of lifted to another world, which is really what's supposed to happen on a Sunday when you're praying," says Tavakoli. "In really a truly beautiful way and not just kitschy or trendy and what is going on with the times, but what is timeless." Pope Francis has announced the new Auxiliary Bishop for the Archdiocese of Miami. He is Monsignor Peter Baldacchino from the European island nation of Malta. Baldacchinno says he is excited to begin his new position of assisting Archbishop Thomas Wenski. "It comes as a surprise to me from the fact that I’m Bishop-elect of the Archdiocese of Miami. I wait to learn what it involves," says Baldacchinno. Baldacchino has spent the past 15 years serving as chancellor of the Mission of Turks and Caicos in the Caribbean. The Archdiocese of Miami is using a TV ad to encourage the Catholic faithful to come to confession this weekend as part of the Lenten season. A month before he died last year at the age of 83, Agustín Román was honored by the Miami Coalition of Christians and Jews for his interfaith work as a Roman Catholic bishop. So the fact that a Jewish author will pen Román’s authorized biography isn’t just fitting -- it is itself a reassuring Miami narrative. During the final months of his life, Román designated El Nuevo Herald religion writer Daniel Shoer Roth, a Venezuelan Jew, to tell his life story. The new Notre Dame d'Haiti church in Little Haiti opened this past weekend. But fundraising for it began eight years ago. For the church’s pastor, Father Reginald Jean-Mary, the process has been much longer than that. "It began 35 years ago when Archbishop [Thomas] Wenski, [back then] Father Wenski, established this mission," Jean-Mary says. "Because at that time what you could say was that this was the 'church of the living stone' because of the people. Who built that church? The people."